Due to Irma, Hawksnest Marathon will be temporarily closed until further notice. Please check back for more details as the clean up continues. Owners please login and check the Hurricane Update Page for the latest updates. 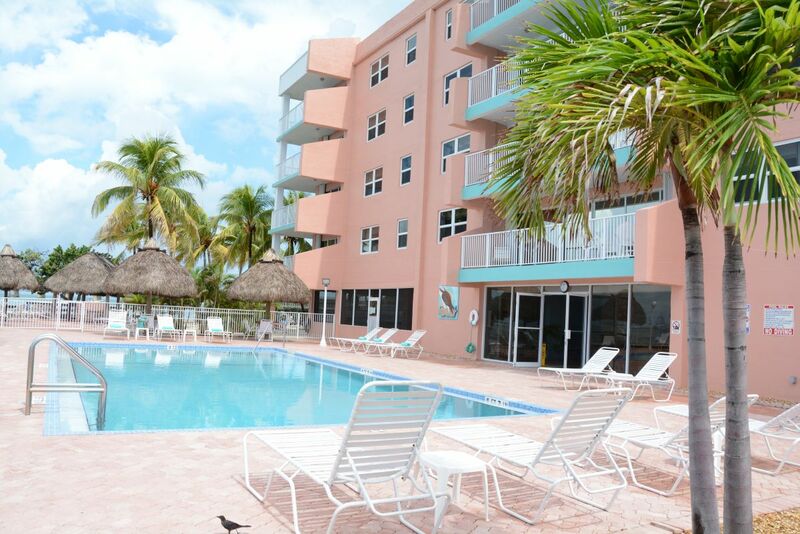 The Hawks Nest is located in the heart of the beautiful Florida Keys, offering gorgeous oceanfront or gulf views. This island refuge is in the water-sports capital of the Florida Keys. About an hour drive from Key West, the resort is at the foot of the famous 7 Mile Bridge and close to Sombrero Beach, Bahia Honda State Park, and Sombrero Reef as well other excellent scuba, snorkeling and fishing spots. This five story, twenty-eight unit timeshare condominium is a little slice of Paradise. Amenities include an oceanfront fresh water pool and separate spa which face a horizon of turquoise water that runs to the reef, where it turns deep blue. The pool and spa are heated and cooled with a geothermal system that maintains the perfect temperature year round. There are tennis courts, fishing docks, on-site powerboat rentals, bicycles, BBQ grills, Tiki huts and a game room for the kids. The resort offers fully equipped and spacious one and two bedroom units with king size beds and queen sleeper sofas. One bedroom units can accommodate up to 4 people and two bedroom units accommodate up to 6 people. Housekeeping services provided. Need to look up your timeshare week? Our calendar will identify the exact week for you. Keep in touch with Hawks Nest on our Facebook page.